FindItMore | T-shirts happen to be one of the most popular and staple forms of apparel that are an integral part of the wardrobe for anyone irrespective of their gender or age. These are a casual wear that are loved for their simplicity, comfort and ease of wear. The best part is that these are also very affordable that you can also get easily. So more and more people are striving today to tap in their popularity and come up with their own t-shirt business venture. T-shirt businesses are quite a preferred choice for both the veterans as well as the beginners who are entering the eCommerce industry for the very first time. This is primarily because t-shirts have universal appeal, can be resourced affordably and customized simply. But one thing that you should keep in mind, in this regard, is that since t-shirts are so popular and come with some inherent advantages there is tremendous competition in this industry. That is why in order to sustain in the long run you have to stand out in the crowd. This can only be achieved by offering high-quality materials and trendy and innovative designs and by creating a strong brand image. But with the right supplier and an efficient t shirt designer software this can be achieved to a great extent. Here are some tips that will assist you in starting your t-shirt business that can succeed and sustain in the long run. Just read on. Come Up with an Idea That Will Sale – Once you have decided that you are starting a t-shirt business, you should begin to brainstorm about possible ideas about your t-shirts. You should jot down the concepts that you get. You have to think about a host of things like whether to go for the graphical or the textual t-shirts, which t-shirt designing software you should go for so that your customers can design their t-shirts, whether you should opt for t-shirts for men or that of women or the unisex ones, which t-shirts are trending now and which design people are leaning towards and many such other related fields. The more answers you try to dig out the more ideas you will get. Try to Identify Your Target Audience – Once you have the ideas you have to decide who are the target audience or to whom you want to sell the t-shirts. Try to be as specific as possible. You have to find out your specific niche. Just female teenagers or men in their 40s is not enough. You have to go for specific segregation like women who have toddlers, grandmas or grandpas or teenagers who play soccer or tourists between the ages of thirty to sixty years vesting a particular city or area and so on. Explore the infinite possibilities. Keep Track of the Competition – You should know well the kind of t-shirt labels you will be competing with. For example, if you are producing t-shirts under the humorous label then you should watch what kind of funny t-shirts your competitors are offering. This will help you to know the trend and can help you be on the edge. 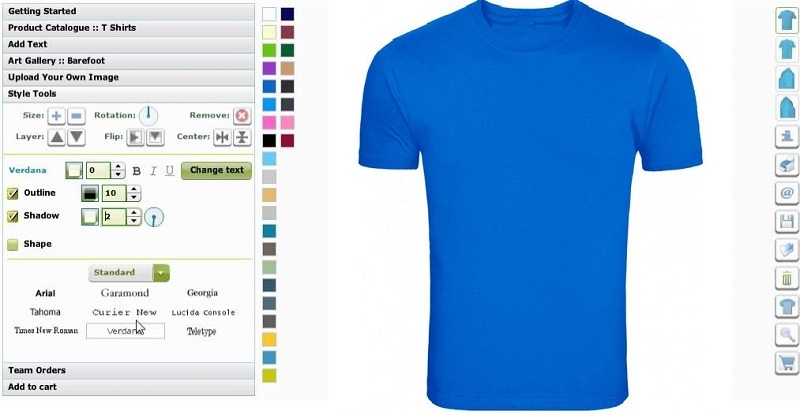 Designing the T–shirts – This is one of the most crucial parts of your t-shirt business. The designs of the t-shirts can make or break your business. If your products have great designs you already are one step ahead. What’s more you can also integrate the unique t-shirt design software with your website so that your customers can design the t-shirts just the way they want. This way you do not have to go through the effort of constantly creating out-of-the-box designs that will appeal to the customers and also make them love your brand and come back to it time and again. Printing the T-Shirts – Some people have their own equipment for printing and they love to screen-print the t-shirts. If you do not have those, then search the internet for screen printers. You should also go for interviewing a few screen printers and then choose the right one. Analyze the Finances that You May Need – Once you have got some idea about where you are going to source the t-shirts, its designing and printing and overall manufacturing you should start summing the amount you need for the start-up. Starting a t-shirt business is not cheap and you have to consider the initial financing in order to determine the price of the clothing. Promoting Your Brand Online and Offline – Just having a website or a retail shop does not mean that people will be thronging your shop. You should first see to it that your site is made SEO-friendly and is well promoted in the social media. You should also advertise offline with the help of leaflets. You should also take the help of other businesses and ask them to exchange links and write comments on other people’s blogs with your back-link and also partner with other businesses that are in your niche but are not your competitors. Pricing the T–shirts – The cost it takes to make the t-shirts determines the amount or the cost of the t-shirts. You should include screen printing costs, actual price of the shirt, costs of hang-tags, shipping costs and other costs like marketing, labor and storage. Also you should decide whether you are selling wholesale or retail. If you are not selling to other boutiques or shops then you can cut the cost as no middleman’s cost is involved. You should set the price that helps you to cover all the other costs and also emerge with a profit. Set Clear Goals – For the business to succeed it is a must that you set goals and believe that you will achieve it and work hard for it. Only then your business will be able to sustain in the long run and evolve. A business that does not evolve dies a slow death. Don’t Quit – If your business does not succeed in the first two months, do not fret. Work towards your designs or your marketing strategy or try to enhance the quality. Keep on trying till you actually succeed. Remember if you believe, you can! The above are some of the tips to start an online t-shirt business. Bring in innovation and quality to your business and go for the latest technologies like a proficient t shirt designing software so that you can make the customers get back to you time and again. NEXT POST Next post: How To Open An MSG File For Free In Windows?